Push button stop start control and connection box for mains input. Various tank sizes to meet high control volume system capacity. 110v single phase, 415v 3 phase or petrol powered. 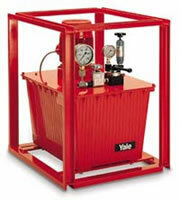 Can be used with single or double acting cylinders. Externally adjustable system pressure valve. 24v Remote pendant control option available. Click the link to the Data sheet you require in PDF format. 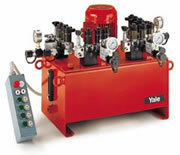 We supply many makes of hydraulic pump and can repair, service and test all makes in our workshop.